The Ohio State University Flute Troupe | McGinty Music, LLC. 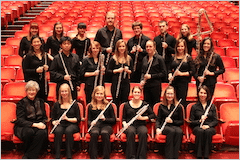 The Ohio State University Flute Troupe, established in 1985 by Professor Katherine Borst Jones, consists of flute majors who are undergraduate and graduate students at The Ohio State University in Columbus, Ohio. The purpose of the group is to explore and expand the literature for flute ensembles of all sizes while learning the skills of chamber music rehearsal, presentation and performance using all the instruments of the flute family. The flute choir instrumentation is varied, using different numbers and combinations of piccolos and flutes in C, alto flutes in G, bass flutes in C and contrabass flute in C. Parts are often doubled or tripled. Known nationally for their high level of performance, The OSU Flute Troupe is recognized as one of the top college flute choirs in the nation. The group performs in the schools of Ohio, in concerts throughout the University as well on concert series throughout the region, on the OSU Contemporary Music Festival and on the 2013 convention of the Society of Composers, Inc. They have performed at four Ohio Music Educators conventions and at the National Flute Association conventions in Chicago, Columbus, Nashville and Charlotte. The group has premiered and commissioned numerous works, including I Sing the Body Electic and Pretty Polly’s Train by Thomas Duffy, How Birds Take Their Own Self Portraits by Daniel Bukvich, Sunshine of Saint Eulalie and Hearts Upon the High Road by Chris Norman, Calliope Capers by Ladd McIntosh and Musings by Roger Cichy. They have also premiered and performed special arrangements by Amara Guitry, Nancy Hadden, Jennifer Higdon, Victoria Jicha, Katherine Borst Jones, Tom Kennedy and now Anne McGinty, among others. She has served the National Flute Association in many roles, including president twice, vice-president, and 1992 convention program chair and has performed and conducted at numerous conventions. She has conducted numerous flute choirs at NFA conventions, including the National High School Flute Choir and the the first NFA Collegiate Flute Choir. She received the National (Distinguished) Service Award in 2011. Ms. Jones is a visiting professor at the Shenyang Conservatory of Music in China. She has recorded for CRI, d’Note and Summit recordings. Harmonious Blacksmith by Handel, arranged by Jones is published by Southern Texas, (now Hal Leonard).